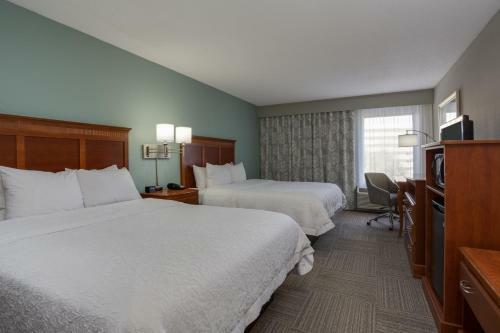 Featuring a convenient location on the Intercoastal Waterway, this North Myrtle Beach hotel is only a short drive from area beaches and attractions, and provides a variety of thoughtful amenities. In the nearby area, guests at the Hampton Inn Harbourgate can enjoy fishing on Cherry Grove Pier, top-rated golfing at Robbers Roost Golf Course and shopping at Colonial Mall. The shops, restaurants and entertainment of Broadway at the Beach as well as local vineyards are also easily accessible. Guests at the Harbourgate Hampton Inn can enjoy beginning the day with a free continental breakfast, or with a refreshing swim in the indoor pool. The hotel also features an on-site fitness centre as well as wireless internet access. Upon check-in photo identification and credit card are required. All special requests are subject to availability upon check-in. Special requests cannot be guaranteed and may incur additional charges. Please note that during the property's renovation they will not be able to provide a hot breakfast. The property will provide a to go breakfast instead. Guests are required to show a photo identification and credit card upon check-in. Please note that all Special Requests are subject to availability and additional charges may apply. the hotel Hampton Inn Harbourgate so we can give you detailed rates for the rooms in the desired period.